In the 1970s, as the Cold War gradually transformed into détente owing to the general easing of tensions between Washington and Moscow and between Washington and Beijing, the status of the Taiwan-based Republic of China (ROC), along with the political legitimacy of the ruling Chinese Nationalist Party (or the Kuomintang), was reduced to a minimum. Although still seeking an alliance with the United States, Nationalist Chinese leaders on Taiwan also explored other foreign policy alternatives. The secret communication between Taipei and Moscow in the late 1960s and the early 1970s, as recent scholarly works have indicated, resulted in a brief political flap in the spring of 1972, when Chiang Kai-shek’s foreign minister, in answering a reporter’s question about Nixon’s historic trip to Beijing, said that Taipei might have its own “Warsaw talks” but with Moscow. Although the ROC Premier Chiang Ching-kuo, the Generalissimo’s son who at this juncture was substantially in charge of Taiwan’s national affairs, determined that it had no alternative but to live with the new US approach toward the Chinese mainland, he was also resolute about seeking to reduce Taiwan’s dependence on the United States. The Chiangs, father and son, were fully aware that, as Taipei had been expelled from the United Nations and had lost almost all important seats in international organizations, there was no way to prevent a diplomatic landslide or stop Taiwan’s allies from switching diplomatic recognition to the People’s Republic of China (PRC). But they were convinced that Taiwan’s national security could best be preserved if anticommunism continued to be a predominant ideological force in East Asia, where Taiwan’s military and intelligence cooperation with its neighbors threatened by communism might move forward, no matter whether diplomatic links existed or not. Wang Sheng (王昇), best known for his close friendship with Chiang Ching-kuo that began in the late 1930s, was entrusted to undertake Taiwan’s military and intelligence diplomacy in the 1970s. In 1939, Wang had joined the KMT and been sent to join the Three Principles of the People Youth Corps training course run by Ching-kuo. After the course, Wang was chosen to work for Chiang, which he did for the next fifty years, including the care of Ching-kuo’s twin sons, the result of an extramarital affair in the late 1930s. In the 1950s, Wang established the precursor to the General Political Warfare College, the elite training school for Nationalist army and party cadres. Second in command of the civil-military programs, welfare, and services section of Chiang Ching-kuo’s cadre system, Wang’s main task was laying the foundation for the China Youth Corps under Ching-kuo’s leadership. He spent most of the 1950s and 1960s training army political cadres, helping the Chiangs reinforce their anticommunist ideology into every corner of Taiwan’s military. Wang Sheng made his name as a prominent anticommunist in the Cold War’s Asian theater when he was slated to export and transplant Taiwan’s political warfare system to South Vietnam. In early 1961, at the request of Ngo Dinh Diem, the president of South Vietnam, Wang led seven Chinese Nationalist officers in inaugurating a series of anticommunist political and psychological training programs in Saigon to strengthen anticommunist ideology and consciousness among South Vietnamese forces. The officer corps soon became actively engaged in reforming South Vietnamese military education, training, intelligence, propaganda, and psychological warfare. At this juncture, Taipei had also quietly begun providing Saigon with self-made military ammunition and materiel. Discussions about jointly producing small arms and light weapons were also underway. The program, which subsequently became an official military advisory group, signified the beginning of what Chiang Kai-shek described as an interdependent anticommunist alliance between Taiwan and South Vietnam. In the spring of 1975, as Saigon was about to be captured by the North Vietnamese, Taiwan was the only country in the world still having an unofficial military advisory group there to assist the hapless and beleaguered South Vietnamese government in its doomed defense against the North. In March 1970, following a military coup against Prince Norodom Sihanouk, an anticommunist regime was established in Cambodia under General Lon Nol. Delighted to see an anticommunist regime emerging in Indochina, Chiang Kai-shek assigned Wang Sheng the task of building ties between Taipei and Phnom Penh. The Nixon administration, in the midst of its endeavor to expand relations with the PRC, strongly objected to Taipei’s attempt to establish diplomatic relations with Lon Nol, lest the move agitated non-aligned governments in Southeast Asia and, in the worst-case scenario, provoked a communist invasion of Cambodia. Thus, a ROC Military Mission, rather than an embassy, was installed in Phnom Penh to promote bilateral cooperation. Wang Sheng’s papers at the Hoover Institution Archives reveal that Lon Nol was so determined to introduce Taiwan’s political warfare system into his army that he wanted to do it regardless of whether his American patrons liked it or not. Beginning in September 1972, Wang’s personnel began streaming into Cambodia to kick-start a psychological and political warfare training program, at the expense of Taiwan’s government budget. That cooperation soon expanded to several other fields such as intelligence gathering, mass mobilization, sabotage, raids, and infiltration. But those training programs did little to prevent Lon Nol’s regime from deteriorating, largely owing to external threats and internal power struggles. Wang Sheng conducted his last inspection trip to Cambodia in December 1974, only to witness the rapid worsening of morale and local economic and security conditions. On the eve of the collapse of the Lon Nol regime in mid-April 1975, Taiwan was the last country to evacuate its Military Mission in Phnom Penh. The fall of Indochina to the Communists in the spring of 1975 increased Chiang Ching-kuo’s urgency in implementing Taiwan’s secret military and intelligence diplomacy. Between the mid-1970s and the early 1980s, Wang Sheng conducted many clandestine visits to virtually every noncommunist states in Southeast Asia, including Thailand (1975 and 1982), Indonesia (1975), the Philippines (1979), and Malaysia (1982), where he met with top leaders and discussed military and intelligence cooperation. In Manila, President Ferdinand Marcos solemnly declared that he and his people were staunchly anticommunist, pledging he would not allow international politics and external forces to affect such anticommunist stance. In addition to advocating the strengthening of close commercial and military ties between the two countries, Marcos’s military staff specifically requested that Taiwan export munitions and light weapons, provide military training of Filipino soldiers, and consider joint intelligence-gathering program aimed at the ongoing Chinese infiltration of the Philippines from Hong Kong. In Kuala Lumpur, Prime Minister Mahathir Mohamad told Wang Sheng that he was willing to strengthen bilateral relationship in a low-profile fashion, emphasizing that his government would not allow external forces, including the PRC, to affect its own political judgments and foreign policy making. Mahathir’s chief military advisers expressed their intention to send Malaysian officers to Taipei learn from Taiwan’s anticommunist ideology and experience. They also asked Taipei for assistance in pacifying Malayan communist forces, providing needed ammunition, building Malaysia’s electronic warfare and veteran service system. Those collaborations, as the Malaysians asserted, could be achieved even in the absence of formal diplomatic relations between Taipei and Kuala Lumpur. The documents from the Wang Sheng Papers presented below provide a rare glimpse into the convictions of top Nationalist Chinese leaders in Taiwan that ingraining anticommunism into the souls of their Southeast Asian neighbors was vital to Taiwan’s international security. They also demonstrate to what extent military and intelligence cooperation between Taipei and Southeast Asian countries was undertaken, even though Taiwan was increasingly isolated after it lost its seat in the United Nations in the fall of 1971 and its diplomatic ties with most of the Southeast Asian countries ceased to exist thereafter. Hsiao-ting Lin is a Research Fellow and Curator of East Asian Collection at the Hoover Institution, Stanford University. 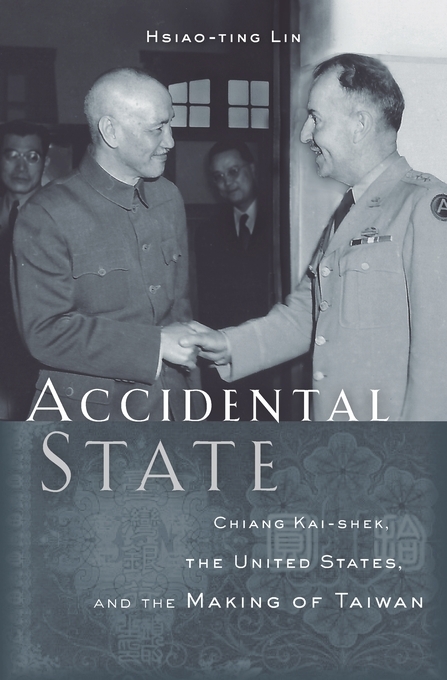 He is the author of, most recently, Accidental State: Chiang Kai-shek, the United States, and the Making of Taiwan (Harvard University Press, 2016). His other publications include Tibet and Nationalist China’s Frontier: Intrigues and Ethnopolitics, 1928-49 (UBC Press, 2006), Modern China’s Ethnic Frontiers: A Journey to the West (Routledge, 2011), and over a hundred journal articles, book chapters, edited volumes, reviews, opinion pieces and translations. He is currently at work on a manuscript that reevaluates Taiwan’s relations with China and the United States during the presidency of Harry Truman to that of Jimmy Carter. He received his D.Phil. in Oriental Studies in 2003 from the University of Oxford. Report submitted by General Wang Sheng (Director of the General Political Warfare Department, Ministry of National Defense, Taiwan) to President Chiang Ching-kuo regarding General Wang’s visit to the Philippines, 18 December 1979. Report submitted by General Wang Sheng (Director of the General Political Warfare Department, Ministry of National Defense, Taiwan) to President Chiang Ching-kuo regarding General Wang’s visit to the Philippines, 19 December 1979. Report submitted by General Wang Sheng (Director of the General Political Warfare Department, Ministry of National Defense, Taiwan) to President Chiang Ching-kuo regarding General Wang’s visit to the Philippines, 20 December 1979. Minutes of the Meeting between Wang Sheng (Director of the General Political Warfare Department, Ministry of National Defense, Taiwan) and Malaysian Prime Minister Mahathir Mohamad, 3 April 1982. Minutes of the Meeting between Wang Sheng (Director of the General Political Warfare Department, Ministry of National Defense, Taiwan) and Lieutenant General Dato Shazali Che Mat (Head of Department of Military Intelligence, Ministry of Defense), 29 March 1982. Minutes of the meeting between Wang Sheng (Director of the General Political Warfare Department, Ministry of National Defense, Taiwan) and General Tan Sri Mohd Ghazali Seith (Chief of Defense Forces, Ministry of Defense), 29 March 1982. Minutes of the Meeting between Wang Sheng (Director of the General Political Warfare Department, Ministry of National Defense, Taiwan) and Abang Abu Bakar (Vice Defense Minister), 29 March 1982. Michael Share, “From Ideological Foe to Uncertain Friend: Soviet Relations with Taiwan, 1943-82,” Cold War History 3, no. 2 (2003): 1-34; Xiang Zhai and Ruping Xiao, “Shifting Political Calculation: The Secret Taiwan-Soviet Talks, 1963-1971,” Cold War History 15, no. 4 (2015): 533-556. Thomas A. Marks, Counterrevolution in China: Wang Sheng and the Kuomintang (London: Frank Cass, 1998), 37-39, 128-172. Report from Li Xiaoyao (ROC military attaché in Saigon) to ROC Ministry of National Defense, May 16, 1962, Wang Sheng Papers, Box 13, Hoover Institution Archives, Stanford University; Memorandum by the Department of Political Warfare, ROC Ministry of National Defense, July 24, 1962, ibid; Report from Wang Sheng to Chiang Ching-kuo, November 24, 1962, ibid. Jie Chen, Foreign Policy of the New Taiwan: Pragmatic Diplomacy in Southeast Asia (Cheltenham, England: Edward Elgar, 2002), pp. 168-170. The Visit to Cambodia File (1972), Wang Sheng Papers, Box 14. The Visits to Cambodia and Thailand Files (1975), Wang Sheng Papers, Box 14. The Visit to the Philippines File, Wang Sheng Papers, Box 15. The Visits to Thailand and Malaysia Files, Wang Sheng Papers, Box 16.